It's Friday and time for another challenge by the Stamp Simply group. You can read about it here. Be sure to check out all the DT too. There are some really cute cards out there! Today's challenge is to use something with Fruit. Thanks to Tammy, I found Basic Grey's new Lemonade 6x6 Paper Pad has this adorable cherry print in it, as well as the lime green. I have been wanting to use this cute 1960's vintage little girl by Crafty Secrets ever since I got it in. This print really called out for her. First I cut my card stock to make a 5x5 square card (love that size), attached the Lemonade Paper to it. Then using the Labels 2, I cut out the lime green border with the largest die and ran it through the Large Dots Cuttlebug Embossing Folder. "Nancy" (that is who she reminds me of) was stamped with Black Memento on Neenah Cream Paper. I colored her using my Copic markers and then cut and embossed the image with the next size down in the Spellbinders Label 2 set. Before taking it out of the die, I used my new Jumbo daubers and "dab" some Ranger Heritage Ink around it to make it look more aged. After attaching it to the lime green border, I popped it up on the DP with the Therm-O-Web Dimensionals. May Arts silk ribbon is a perfect color and I used the Bow Easy to tie the double bow. Feeling it needed some more texture, I added the new Lemonade Brads (cut the backs off and adhered with glue dots.) on to the bottom border that was cut with Martha Stewart's Scalloped Border punch. Joan's Gardens: Just click on the links I have provided for each item. What an adorable creation JOan!!! 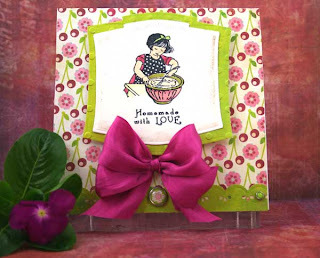 Love the cherry patterned paper with this cute little cook! FANTASTIC!! Totally darling, Joan - LOVE those colors, image -- just lovely! Love the card Joan, It is so sweet. Totally sweet and that bow is awesome!!!! What a sweet creation all the way around!! I almost used that same paper for my card this week! And, when I looked at your card I knew, knew, knew you used the Bow Easy! That little contraption is just too fun! Happy Weekend! Is that Nesties, Label 2 by chance?? What a cute card Joan, love the stamp, a fabulous design with beautiful colors! Great job with the challenge! 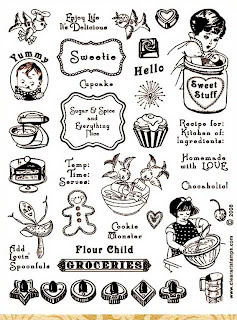 This is such a cute line of stamps. I love the card! The cherry patterned paper and outrageously gorgeous bow are perfect with this sweet image. So cute, Joan!